Most people have been aware that there is a high incidence of mental illness and substance use disorders among the homeless. 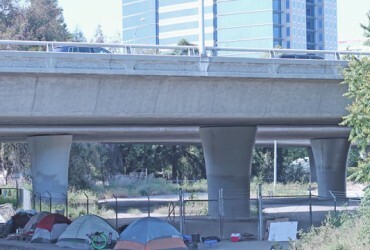 Many people also know that homeless people tend to suffer from a lot of chronic diseases. Some know that the average life expectancy for the homeless in America is about 45 years old. It is somewhat common knowledge that a large percentage of homeless people experience injuries as a result of falls, accidents, domestic violence, and assaults. The thing that none of us really knew until a few years ago, however, is that the incidence of Traumatic Brain Injury (TBI) among the homeless is astronomically high. When I surveyed my patients, I decided to include a TBI screen because there were a few small studies that found a high rate of TBI among the homeless. It was not something I routinely screened for in my clinic, and I thought it would be interesting to look at. It can be surprisingly difficult to define a TBI. Fortunately there are validated questionnaires; I used one from Ohio State University, which categorized their injuries by severity. The injuries ranged from a mild concussion to an extended period of loss of consciousness. The results were impressive. Seventy-six percent of my patients (N=127) screened positive for at least one lifetime TBI; over half, 55.2%, stated that they had a TBI as a child (prior to age 18). This is unbelievably high. It is estimated that about 12% of the general population has experienced some kind of TBI. 76.0% and 55.2% are both astounding numbers. Many of us know someone who has experienced a concussion, often during some kind of sporting event. Some may be thinking, “One TBI is not really that big of a deal.” It is true that the number and severity of TBI matters, and even the age at which it happened. Studies have shown that TBIs involving loss of consciousness (LOC) prior to age 15 are associated with long term differences in brain function. 22.4% of the 127 patients interviewed recalled injuries which satisfied these criteria. That is greater than 1 in 5 of my homeless patients. Thinking back to those sporting events, fortunately it is quite rare that an injury will result in loss of consciousness in a young athlete. Unfortunately, those TBIs reported by my patients were very often the result of caregiver abuse or neglect. The fact that TBIs are problematic for people is generally intuitive. All types of TBIs are linked with depression, aggressive behaviors, and post-concussive symptoms. They are linked to substance use disorders in both a chicken and an egg sort of way. Moderate and severe TBIs are associated with multiple social, cognitive, psychological, and medical problems including social isolation, unemployment, cognitive deficits, suicide, psychosis, and progressive dementia. 58.4% of my patients described having experienced TBIs which were categorized as moderate or severe. These sequelae, seen among NFL players, have been brought to light recently in the mainstream media. When I try to wrap my mind around the fact that the majority of my homeless patients report having experienced a moderate or severe TBI, I realize a couple of things. First, it is heartbreaking to me that so many of them must figure out the complexity of life lived outside with additional cognitive limitations. It is already plenty difficult to find food, to stay warm and safe, and to get around town without any impairments. Second, it makes more sense that many of my patients struggle to follow my directions, make impulsive decisions, appear forgetful, and experience mood dysregulation. Unfortunately, it is very difficult to undo a brain injury. The ideal place to intervene is in prevention. I am encouraged by the number of low income and homeless housing projects that are currently underway, as I hope these will allow individuals and families to get into safe indoor environments where they will be protected from assaults and accidents. There is also a great need for increased support for addiction treatment to decrease the number of falls, overdoses, violent incidents, and accidents resulting from substance use disorders. There is a tremendous need for social workers, schools, doctors, pastors, and others to recognize the signs of child abuse and neglect to protect young ones from those devastating injuries which can have livelong consequences. There is a need for athletics programs to protect their young athletes from TBIs.